English poet Samuel Taylor Coleridge’s The Rime of the Ancient Mariner includes the famous line: “water, water, every where, nor any drop to drink.” It’s a sort of cautionary statement about the ills of drinking salt water – a life-threatening problem for those stranded at sea. Scientists from the University of Texas at Austin and Germany’s University of Marburg are working to help marooned sailors and everyone else who needs access to non-salty drinkable water. 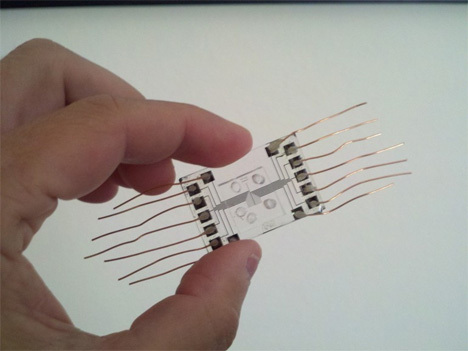 They’ve come up with a plastic “water chip” that can desalinate sea water. It will hopefully replace the problematic membrane system previously used for the same purpose. But the chips aren’t exactly ready to hand out to every sailor in the Navy. The water chip’s capabilities are limited to desalinating 25% of the water (99% is needed to become drinkable). But it gives hope that being stranded at sea will allow the person something drinkable when “water, water” is everywhere.